The Telit Evaluation Kit for Mini PCIe provides a robust, future-proof and flexible environment to streamline all application development based on Telit Mini PCIe families, significantly reducing time-to-market. 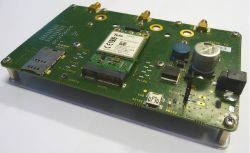 The kit includes a motherboard where to connect the Interface board of a Telit Mini PCIe. The motherboard includes the basic interfaces such as Power input, SIM card holder, USB, antenna connections etc.